Why Is beIN SPORTS No Longer On AT&T U-verse / DIRECTV ? Don’t let AT&T U-verse/DIRECTV keep you from enjoying the best soccer leagues in the world like LaLiga and Ligue 1, MotoGP, MotoAmerica, WTA, MMA, and other world-class sports. beIN SPORTS and beIN SPORTS en Español regret to report that, despite our best efforts to reach a fair agreement, AT&T U-verse/DIRECTV has dropped both stations from its channel lineup. This means those carriers will no longer provide viewers access to the world-class sports programming offered by beIN such as La Liga and Ligue 1. We are fighting to move our channels into lower priced packages where viewers pay less, while AT&T U-verse/DIRECTV wants to keep beIN in more expensive packages. 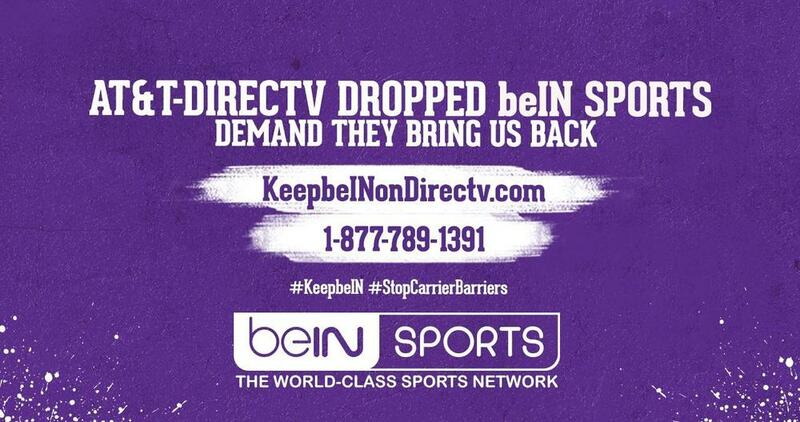 Subscribers who would like to keep beIN SPORTS and beIN SPORTS en Español can visit Keep beIN on DIRECTV or call 1-877-789-1391 to file a complaint with their cable provider directly. Your support can make the difference to #StopCarrierBarriers and #KeepbeIN! Previous Why Is beIN SPORTS No Longer on Xfinity? Next Why Is beIN SPORTS No Longer on Fios?